Finally! 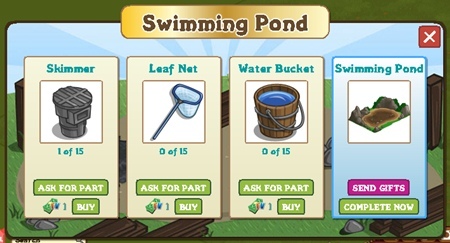 You can now raise Water Animals on your Land Farm as FarmVille has just recently releases the new building storage the Swimming Pond. Yup, the new Swimming Hole can be built in any of your farms eg. Lighthouse Cove, English Country Side, Home Farm and even in Winter Wonderland? Harvesting water animals can now be more easy with this new Animal Building storage. If you still don’t have started building one yet? Just go to the Market and use search and type for” Swimming Pond” to find it easily. Look Inside: Check the status of your Swimming Pond. Send Parts: Help your friends by sending building parts. Apply Instant Grow: Instantly making the Swimming Pond “ready” for harvest. Move: relocate or rearrange the structure. It will need Skimmer x15, Leaf Net x15 and Water Bucket x15 to finish. Aloha Dolphin, Bedazzled Dolphin, Bottle Nosed Dolphin, Bride Dolphin, Groom Dolphin and Finless Porpoise. Blob Fish, Blue Marlin, Blue Tang, Clown Fish, Clown Trigger Fish and Cryptoclydus. Cuttle Fish, Dugong, Purple Dugong, Eagle Ray, Elephant Seal and Emperor Angle Fish. Eurasian Otter, Finless Porpoise, Flying Fish, Hammer Head Shark, Hawaiian Shirt Sea Horse and Jelly Fish. Koi Fish, Lava Fish, Leafy Sea Dragon, Leopard Shark, Light Totem Mask Turtle and Lion Fish. Mahi Mahi, Manatee, Manta Ray, Mini Orca, Monster Octopus and Moorish Idol. Moray Eel, Narwhal, Nautilus, Oar Fish, Pink Dolphin and Pink Whale. Piraiba Catfish. Piranha, Puffer Fish, Rainbow Fish, Red Arowana and Red Snapper. River Dolphin, River Dragon, Sea Horse, Sea Hrse Princess, Horse Sea Horse and Sea Otter. Tail Skipping Dolphin, Tucuxi Dolphin, Water Dragon, Whale Shark, White Tip Shark and Zebra Shark. It is locked. What level does it unlock? 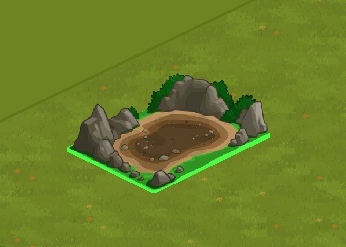 The Swimming Pond? Level 5 🙂 Image. your current level in XP. My pond only takes blue tang fish for some weird reason. 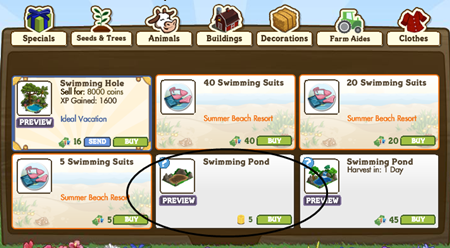 Any other water animal that I grow at the pond will turn from water baby into grown animal but will end up in my gift box and when I try to place it in my pond, it doesn’t work. I tried it with a manta ray, ofr example, that I grew next to the pond. I could later place it in the Hawaiian aquarium without any problems but the Lighthouse Cove pond didn’t accept it, even though it was grown there. Does anybody know why that is? Got the pond on my home farm. I don’t want the blue tank fish that it came with. How do I remove the fish from the pond? We’re having the same issue as well 🙁 once you placed an animal on it, it can’t be put back straight into Gift Box or Storage. Can’t even sell. Update: Found a way 🙂 Click remove the Animals you want to remove and drop it into your “Storage Cellar”. Thanks for letting us know how to remove the fish from the pond. I’d been puzzling over this for weeks. 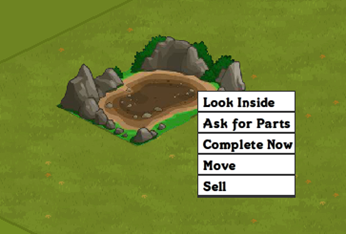 What do I have to do to unlock the swimming pond? something was mentioned about level 5 but level 5 of what?